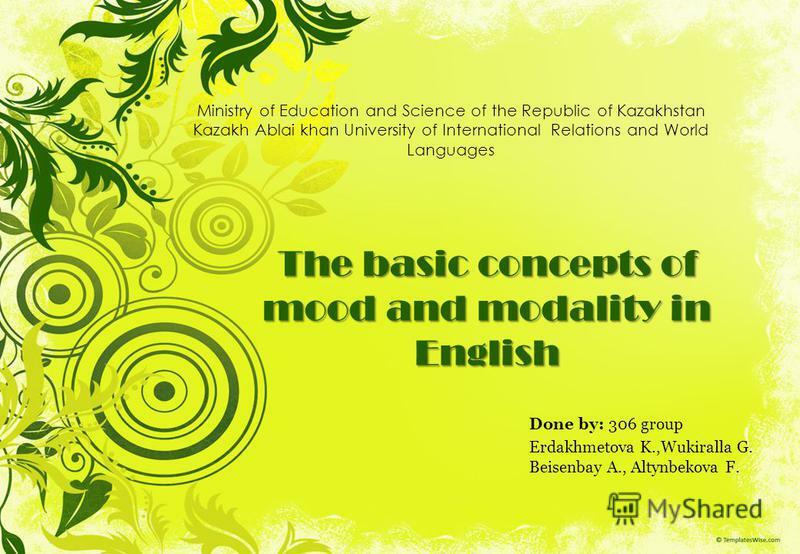 Презентация на тему: "The basic concepts of mood and modality in English Done by: 306 group Erdakhmetova K.,Wukiralla G. Beisenbay A., Altynbekova F. Ministry of Education and.". Скачать бесплатно и без регистрации. 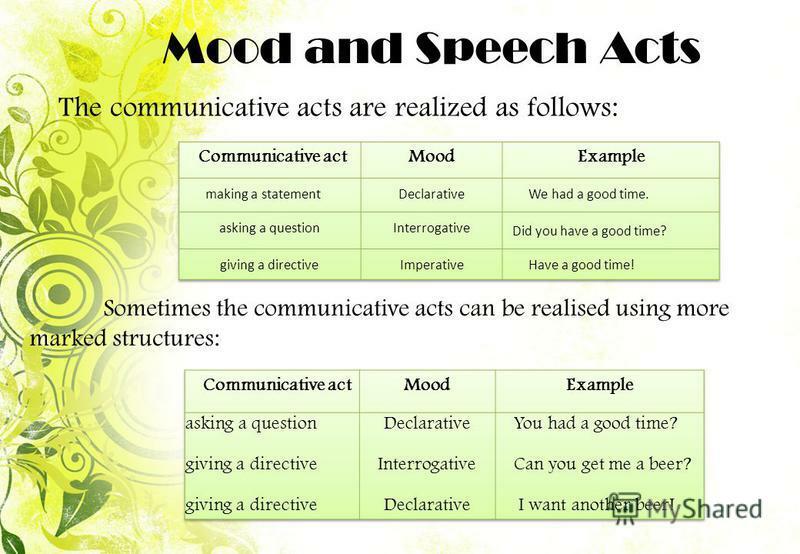 2 Intoduction Mood and modality relate to the linguistic expression of the speakers attitude toward an utterancea simple enough notion at this level of abstraction. 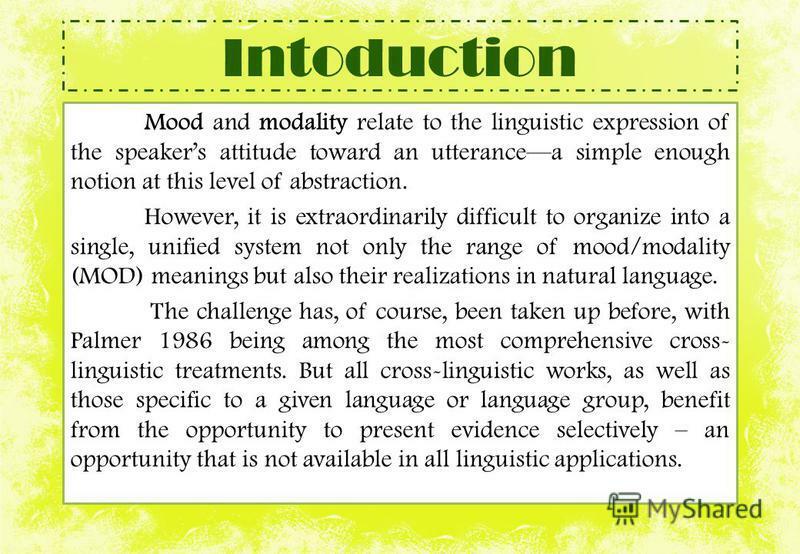 However, it is extraordinarily difficult to organize into a single, unified system not only the range of mood/modality (MOD) meanings but also their realizations in natural language. The challenge has, of course, been taken up before, with Palmer 1986 being among the most comprehensive cross- linguistic treatments. But all cross-linguistic works, as well as those specific to a given language or language group, benefit from the opportunity to present evidence selectively – an opportunity that is not available in all linguistic applications. 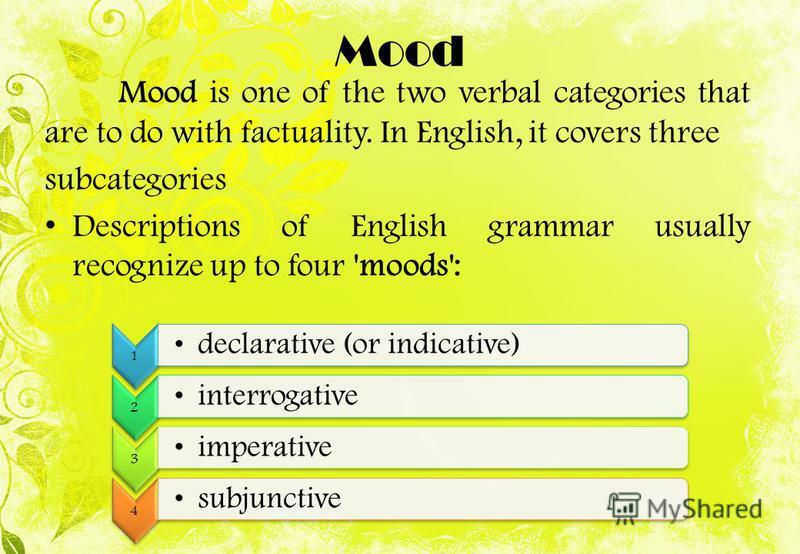 3 'Mood' and 'modality' are separate components of grammar, but they're related in origin and to some extent in meaning. 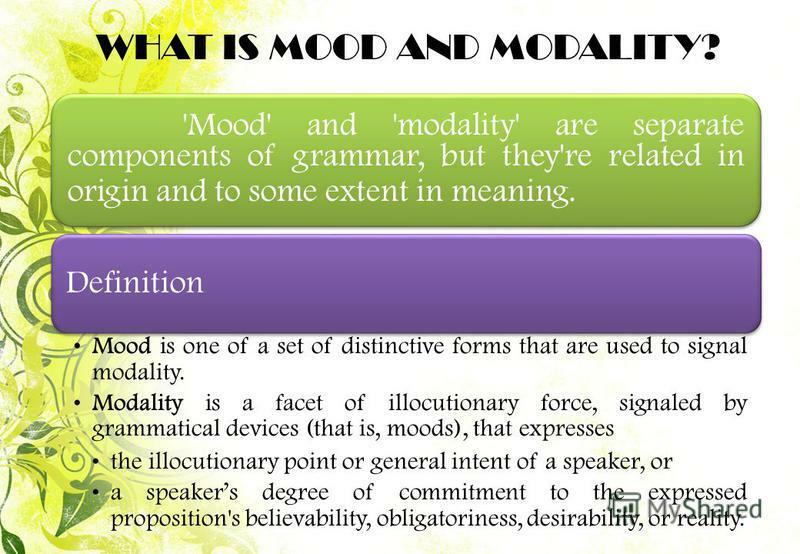 Definition Mood is one of a set of distinctive forms that are used to signal modality. 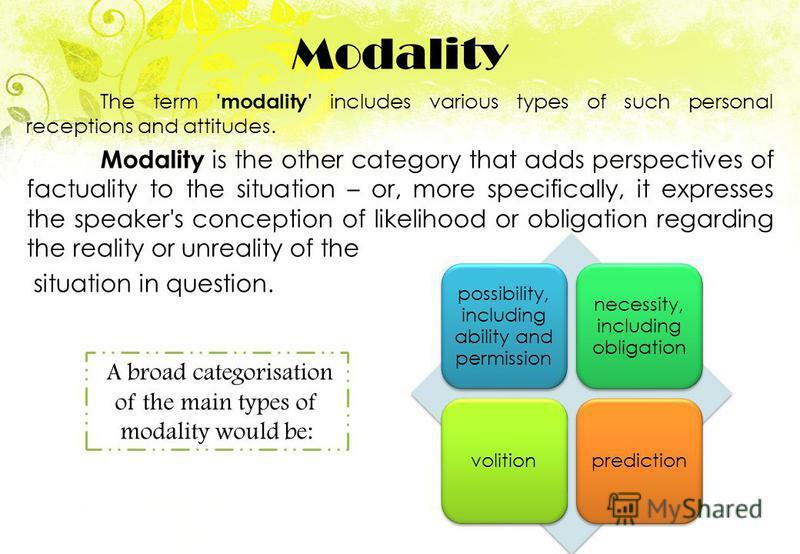 Modality is a facet of illocutionary force, signaled by grammatical devices (that is, moods), that expresses the illocutionary point or general intent of a speaker, or a speakers degree of commitment to the expressed proposition's believability, obligatoriness, desirability, or reality. 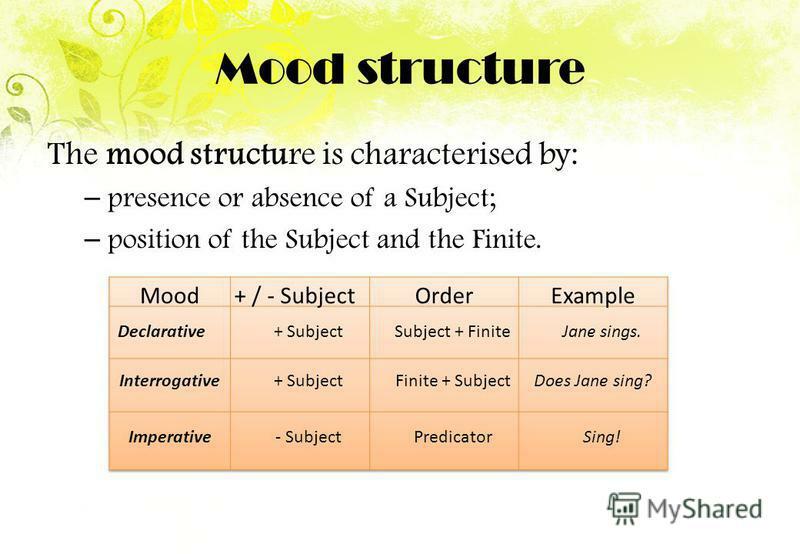 WHAT IS MOOD AND MODALITY? 5 Mood structure The mood structure is characterised by: – presence or absence of a Subject; – position of the Subject and the Finite. 7 Declarative These sentences would be regarded as examples of the 'declarative mood': We always meet at the same pub. I've never met him. Declarative sentences express statements, but they often have other functions too: You've left the light on. (This can mean 'Turn it off'.) Declarative sentences typically have subject + verb word order. But sometimes there's no subject: Don't know where he is. Probably missed his train. - and sometimes the subject is after the verb: Then came the prize-giving. - or between the auxiliary and main verbs: Rarely have I seen such incompetence. 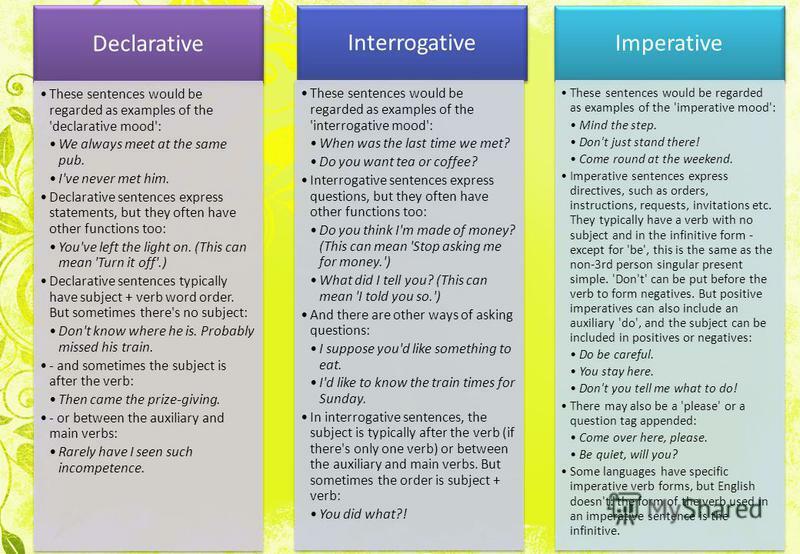 Interrogative These sentences would be regarded as examples of the 'interrogative mood': When was the last time we met? Do you want tea or coffee? Interrogative sentences express questions, but they often have other functions too: Do you think I'm made of money? (This can mean 'Stop asking me for money.') What did I tell you? (This can mean 'I told you so.') And there are other ways of asking questions: I suppose you'd like something to eat. I'd like to know the train times for Sunday. In interrogative sentences, the subject is typically after the verb (if there's only one verb) or between the auxiliary and main verbs. But sometimes the order is subject + verb: You did what?! Imperative These sentences would be regarded as examples of the 'imperative mood': Mind the step. Don't just stand there! Come round at the weekend. Imperative sentences express directives, such as orders, instructions, requests, invitations etc. They typically have a verb with no subject and in the infinitive form - except for 'be', this is the same as the non-3rd person singular present simple. 'Don't' can be put before the verb to form negatives. But positive imperatives can also include an auxiliary 'do', and the subject can be included in positives or negatives: Do be careful. You stay here. Don't you tell me what to do! There may also be a 'please' or a question tag appended: Come over here, please. Be quiet, will you? Some languages have specific imperative verb forms, but English doesn't: the form of the verb used in an imperative sentence is the infinitive. 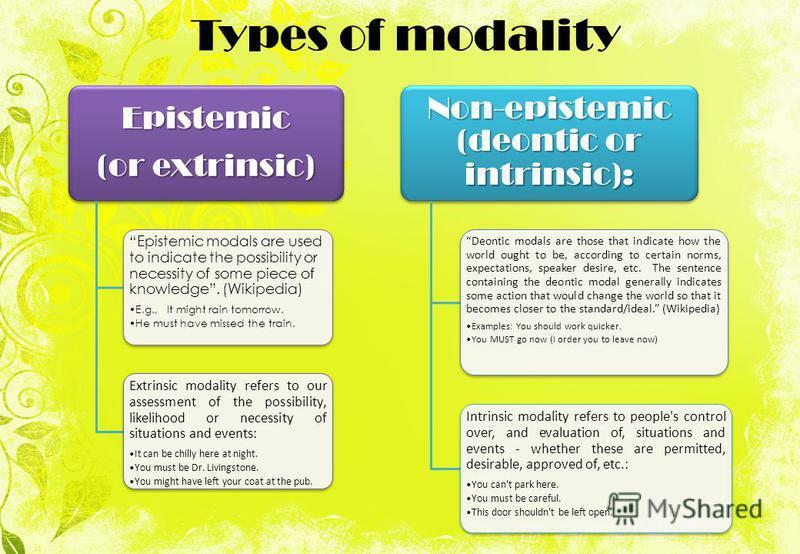 11 Types of modality Epistemic (or extrinsic) Epistemic modals are used to indicate the possibility or necessity of some piece of knowledge. (Wikipedia) E.g.,It might rain tomorrow. He must have missed the train. Extrinsic modality refers to our assessment of the possibility, likelihood or necessity of situations and events: It can be chilly here at night. You must be Dr. Livingstone. You might have left your coat at the pub. Non-epistemic (deontic or intrinsic): Deontic modals are those that indicate how the world ought to be, according to certain norms, expectations, speaker desire, etc. The sentence containing the deontic modal generally indicates some action that would change the world so that it becomes closer to the standard/ideal. (Wikipedia) Examples: You should work quicker. You MUST go now (I order you to leave now) Intrinsic modality refers to people's control over, and evaluation of, situations and events - whether these are permitted, desirable, approved of, etc. : You can't park here. You must be careful. This door shouldn't be left open. 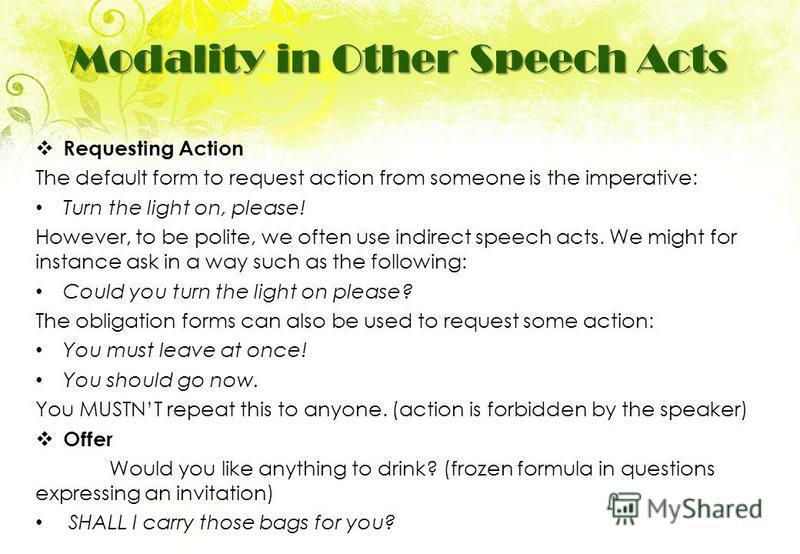 12 Modality in Other Speech Acts Asking and Giving Permission Not all speech acts give information. 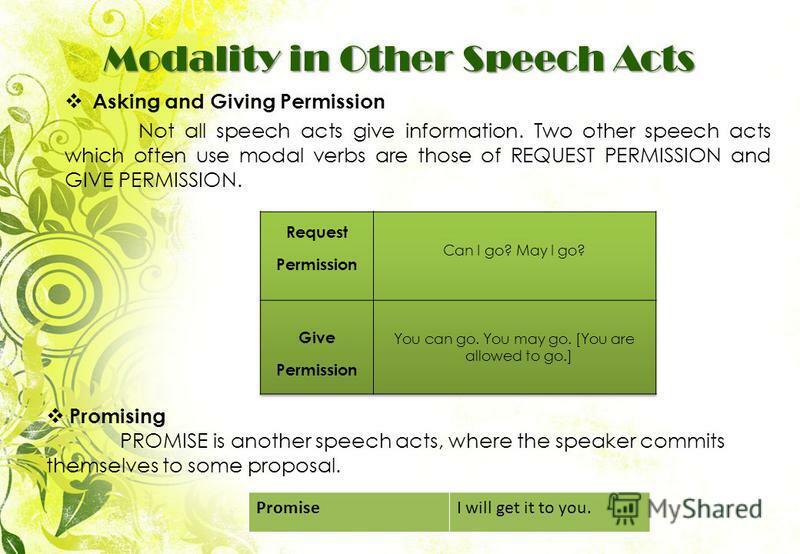 Two other speech acts which often use modal verbs are those of REQUEST PERMISSION and GIVE PERMISSION. Promising PROMISE is another speech acts, where the speaker commits themselves to some proposal. PromiseI will get it to you. The category of mood. The category of mood is an explicit verbal category expressing the relation of the action denoted by the predicate to reality as. We use must: To express obligation, necessity and duty. You must wear a helmet when riding a motorcycle. ( You have to wear a helmet.) To express that. 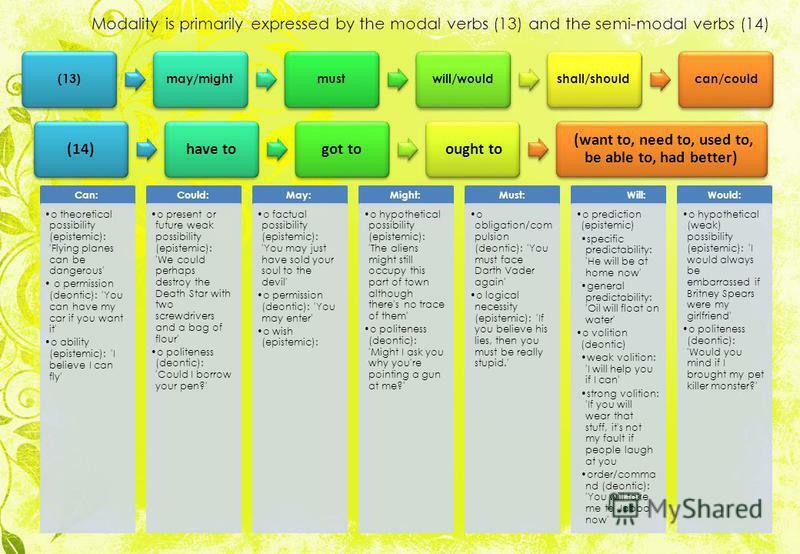 MODALS W HICH ARE THE DIFFERENCES BETWEEN MODALS AND VERBS ? VERBSMODALS Singular / Plural-S / -ES / -IES (He plays, We play) NO variation (He must, We. Direct Speech / Quo Indirect Speech Indirect Speech Saying exactly what someone has said is called direct speech (sometimes called quoted speech). Here. 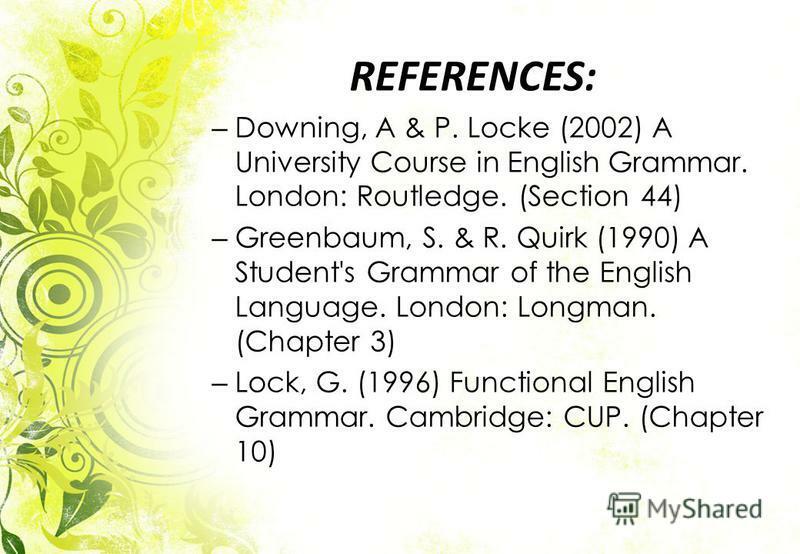 Conditionals- Type 0/Type 1. A conditional consists of two parts: the if –clause ( hypothesis), which begins with the word if, and the main clause, which. LET US LEARN and PRACTICE! Conditional 0 If +Present Simple, Present simple Real actions -100% Situations that are always true if something happens. THE SUBJUNCTIVE MOOD The 6 th Form. 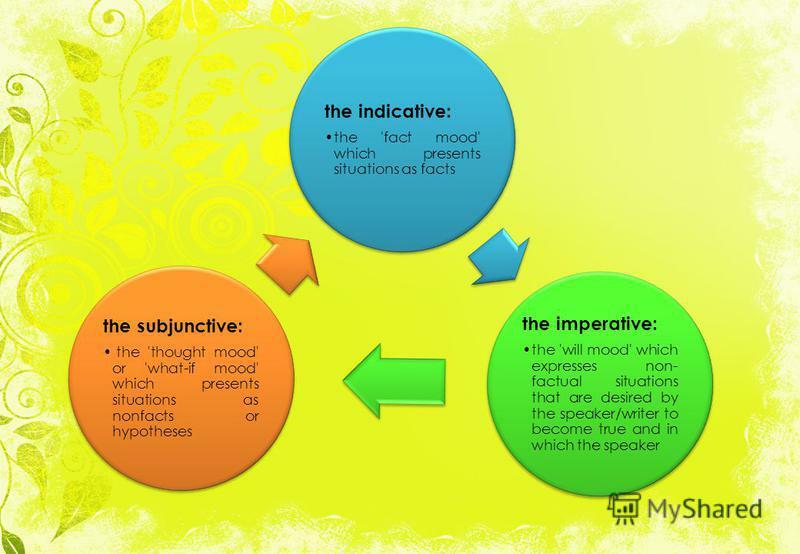 THE INDICATIVE MOOD (All actions are real) If + Present Simple, will + Infinitive Will + Infinitive if + Present Simple.